The Victoria Sandwich (named after Queen Victoria) was originally shaped in a long loaf, filled, and cut into fingers or "sandwiches." 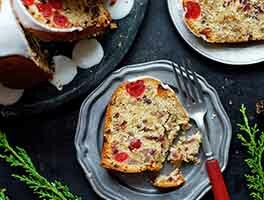 It has become the quintessential round cake that every English homemaker has had in her repertoire from the time of its royal debut, both the original and, in the decades since, countless versions and incarnations. This is a small everyday cake meant for tea rather than an elaborate celebration. 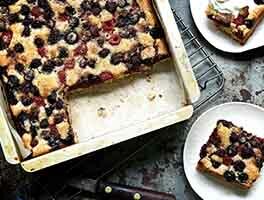 And, because it's made with "self-raising flour," it's an everyday kind of cake to make. You'll find almost this exact recipe for Victoria Sandwich or Sponge in every British baking book. *Not in the classic recipe, but it improves the flavor. Preheat your oven to 350°F. Grease two 8" round cake pans. Add the extracts, if you're using them. Divide the stiff batter evenly between the cake pans; there'll be 11 to 12 ounces of batter in each, depending on the size eggs you used. When the cakes are cool, place one layer on a plate. Spread with the jam of your choice. Whip the cream — 2/3 cup cream makes a medium-thickness layer of filling; 3/4 cup cream, a thick layer. Sprinkle in 2 tablespoons granulated sugar, or to taste, as you whip the cream until it's quite stiff. Stir in the vanilla at the end. Spread the whipped cream over the jam. Top with the second layer of cake. Brush the top of the cake with syrup, and sprinkle with coarse white sparkling sugar, if desired. Or sprinkle with confectioners' sugar just before serving. Refrigerate the cake until you're ready to serve it. It'll be at its best within 12 hours; but is still quite good up to 2 or even 3 days later. The difference will be the whipped cream, which will gradually settle/compact. This recipe reprinted from The Baking Sheet Newsletter, Vol. XI, No. 6, Autumn 2000 issue. 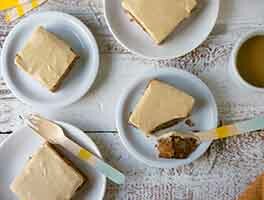 A typical British version of this cake might be topped with extra-fine (castor) sugar or confectioners' (icing) sugar, and filled with jam and buttercream, rather than whipped cream. British buttercream, unlike what we're used to here in America, is simply butter and confectioners' sugar whipped together until smooth. 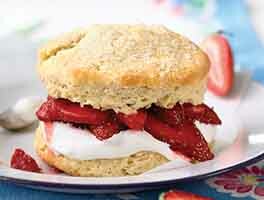 Strawberry jam is the typical British filling. However, we usually choose apricot jam or ginger marmalade paired with ginger syrup; stirring a bit of finely diced crystallized ginger into the whipped cream is tasty, too. Don't have self-rising flour? 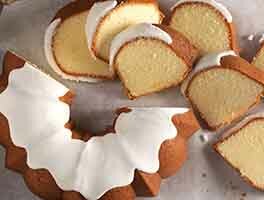 Try our recipe for Golden Vanilla Cake using all-purpose flour; then finish with jam and whipped cream as directed in the recipe above. This is a go-to recipe and a must have for any home baker! I fell in love with it on the British Baking Show and then sought a recipe that I could adapt for the US and this is IT! It's really important to not overbake it. If using 8 inch pans, I start with the least amount of time recommended. And it's also important to know that it won't rise much. There isn't much batter for each of the two pans. But as you can see, once you stack it it's really a good sized cake. This recipe came out perfect for me, however I have made a few Victoria sandwich cakes using recipies from the UK so I feel I may have already learned some of the finer points of baking it. Most importantly do not over bake and do not open the oven to check it too early-the middle will collapse. Also, these do not bake up four inches thick the way I think we are accused to seeing our American style later cakes. Also-it bears mentioning I think in case some bakers may not realize, there is a difference between US and UK self rising or self raising flour. A baker may not have had KA self rising flour, may have looked up a recipe to make it at home and may have made the UK version which I'm guessing will Not quite work out as expected in a US recipe. Thank you KA for your attention to detail and your amazing products and recipes! Tried it, and measured carefully. Try another recipe, gang. I called the Baker's Hotline yesterday to ask if I could make the sponge gluten free using Measure foreasure, with the addition of 2 1/4 tsp baking powder and 3/4 tsp of salt. Everything else was identical and weighed. The cakes hardly rose! It's ok, I will use extra jam and whipped cream, but this isn't what I expected. I had the same problem that others have had in the the cake didn't rise much. I noticed that similar recipes on the BBC website include the addition of extra baking powder even though they are using self rising flour. I suspect this will solve the problem. This recipe was DELICIOUS in flavor, but dense in texture. Now I'm not saying that I made it right, but I'm not sure about it. I used self rising flour for sure, but the batter was stiff more like a cookie dough. But seriously so tasty I can't even believe it because the ingredients are so simple. Made this recipe as listed, including King Arthur Self-Rising flour. Two eight inch pans. Each cake layer was about 1/2 inch in height. I'm thinking there is not enough flour or baking powder in recipe. I converted this recipe to grams and double checked all the weights. Could this recipe just be incorrect? Hi Db, we're sorry to hear your Victoria Sandwich Cakes didn't turn out quite as lofty as you hoped. It's true that when the batter is spread into the bottom of the cake pans, it looks to be quite thin. However, if your Self-Rising Flour is fresh and the butter and sugar have been properly creamed, the layers should get some lift in the oven. The final cakes should be about 1 1/2" tall, as pictured above. The cake did not rise at all, it was like a pancake. I followed the recipe exactly. I will be using a different recipe. I even used King Arthur flour. Very disappointing! Easy and delicious! Note: these cakes stuck to my (greased) pans and wouldn't come out without a fight - I recommend taking the extra step of cutting parchment pan liners.